oomph. : [oomph] makes. 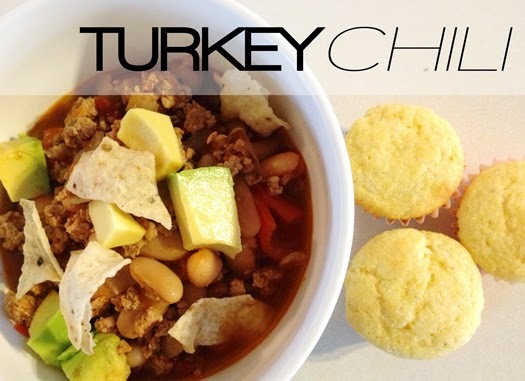 speedy turkey chili. i'm all about the quick and easy. this turkey chili recipe from prevention magazine caught my eye for several reasons: speedy (duh! ), no complicated ingredients, made use of avocado and greek yogurt, both of which i have an overabundance of at the moment. the cool yogurt and avocado complemented the warm chili perfectly. and, of course, no chili is complete without cornbread! this jiffy corn muffin mix makes mini muffins in 10 minutes. all together a simple and fast meal that you can prep and get on the table in less than 45 minutes. i tweaked the recipe using what i had on hand. *saute in big pot until turkey browns. *add remaining ingredients and cook 30 minutes. Looks so yummy!! lovely recipe!! This looks delicious Becks! So easy to prepare too!